It was right there that Father Walter saw something that would change his life—Jesus accepting the Father’s will for him, in the concrete circumstances of his life. 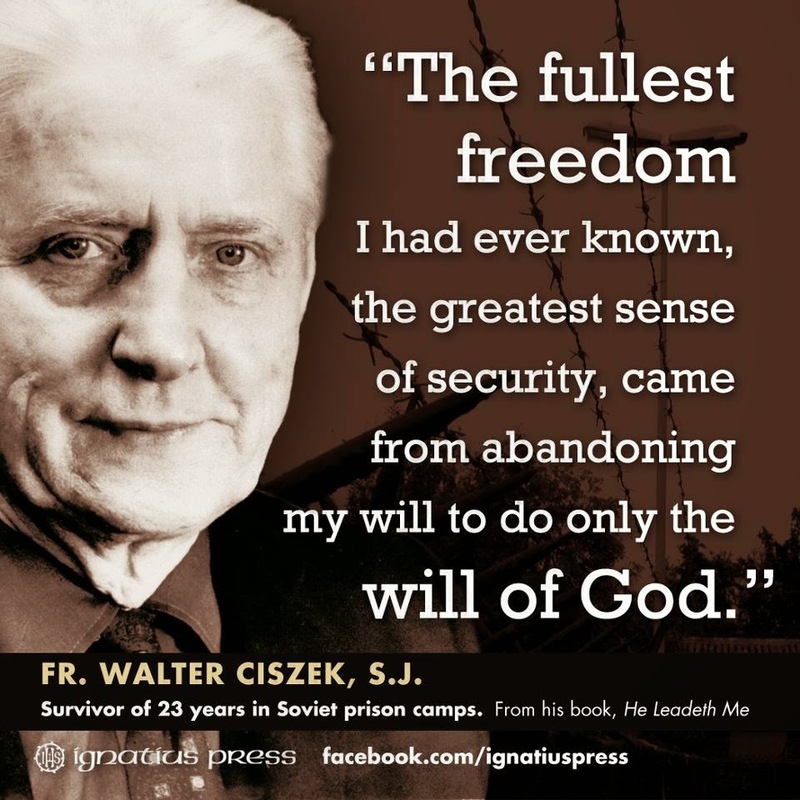 Father Walter, then, in the light of his firm belief that Jesus lived his life as an example for us all, came to realize that he could do no less—that he too would have to accept God’s will for him, in the concrete circumstances of his life, even if those circumstances would include six years of solitary confinement in Lubianka, nine years of living death in the labor camps of Siberia, several more years of being hounded, from one Siberian city to another by the Soviet secret police. It was in that acceptance that Father Walter came to realize the great things God had done for him in Russia. He was filled with a spirit of peace, which no one could ever take from him, a peace which was the wonder of everyone who ever met him, a peace he so willingly shared with anyone who ever came to him. The retreatant asked Father to say the prayer along with her. Interestingly enough he confided to her that he had not been able to say that prayer for many years. He explained that the last time he had prayed the Suscipe, was once, long ago, in the Novitiate. He added, however, that he had become reluctant to pray it once again, because, many times, in Russia, he felt, in his sufferings, that God had taken very seriously what he had said in that prayer, way back in the novitiate, that God did indeed take from him all that he had and called his own. But the fact is that Father Walter did continue to pray that Suscipe, over and over again, not, perhaps, always in the exact, same, soaring words of St. Ignatius. But he did pray it in the resignation with which he bore his suffering in Lubianka, in the courage he showed ministering to his flock in the prison camps of Siberia, and most certainly did he pray it in the words of advice he unfailingly gave, over and over again, to all who would listen to him.